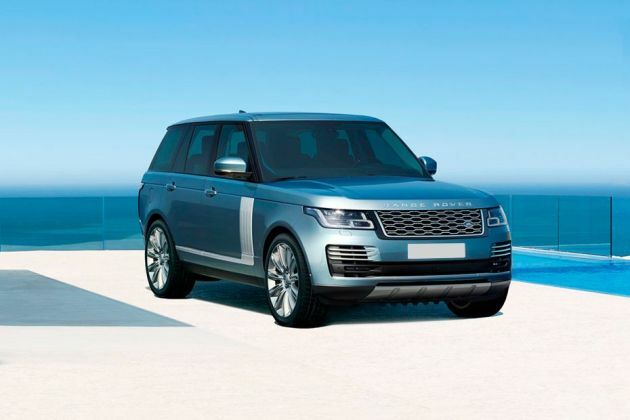 Tata owned, British luxury car maker Land Rover has launched the limited edition of its one of the most expensive SUV, Range Rover in the Indian car market. It is christened as Land Rover Range Rover LWB 4.4 SDV8 Autobiography Black Edition, which is launched with a few additional features. Now it looks stylish and offers better comforts to the occupants. The company has not made any mechanical changes to this variant and is fitted with the same 4367cc diesel engine. It is incorporated with a direct injection fuel supply system for better fuel efficiency. It is helps the engine to produce a power output of 335.2bhp in combination with a hammering torque of 700Nm. This diesel motor is mated with an eight speed automatic transmission, which enables this vehicle to deliver a power packed performance along with decent fuel economy as well. Its braking and suspension mechanisms are quite reliable and keeps it well balanced in every condition. Its decent ground clearance and long wheelbase makes it capable for off-roading. It is bestowed with a vital aspect called terrain response system that reduces the efforts of driver besides improving the performance. As far as additional features are concerned it includes few exterior aspects like uniquely finished grille and side vents, chrome detailing on tail gate, a stylish tail light cluster and a brand new set of bespoke high gloss 21-inch aluminum wheels, which are covered with high performance tubeless tyres. On the other hand, its internal section is designed with black spoils, which gives it a classy and modern look. It also has bespoke seat cover, which is specially designed for leather chairs. It also has leather inserts on door trim, cargo area, pillars, rear hatch and head liner. There is an option to choose from the color combination of seat cover, which are Ebony and Lunar, Espresso and Tan along with Dark Cherry and Ivory. In addition to these, it also has front seat with massaging function, driver set with 18-way articulation, rear seat entertainment unit with 10.2-inch screens, which also has navigation system and a center console between rear seats with several control buttons. This SUV will compete against the likes of Mercedes Benz GL Class, Volvo XC 90, Audi Q7 and others in this segment. To begin with the frontage, it is designed with a large headlight cluster with black surround, which is equipped with adaptive xenon headlamps and turn indicators. The signature dark atlas radiator grille is garnished in a lot of chrome with perforated slats. This grille is further embedded with company's logo in the center. In addition to this, its bonnet is skillfully decorated with 'RANGE ROVER' lettering, which emphasizes the distinct appeal of the vehicle. Just below this, it has a body colored massive bumper, which houses a sleek air dam and a pair of air ducts for cooling the engine quickly. It is flanked by a couple of bright LED fog lamps as well. Furthermore, this bumper is accompanied by a black finished cladding that prevents the vehicle from minor damages. Coming to its side profile, it has a unique stance, thanks to the 3-line design principle and pillars with high-gloss black treatment. The black colored outside mirrors further enhances its distinct appeal. The car maker is offering the wheel arches with a brand new set of stylish 21-inch bespoke design alloy wheels, which are covered with high performance tubeless radial tyres that ensure superior grip on any road conditions. Its rear profile has a flat windscreen accompanied by a black colored spoiler with integrated LED third brake light. It also has a defogger along with wash and wipe function as well. The taillight is quite attractive as it is skilfully decorated with a horizontal chrome strip along with model lettering. Surrounding this is the swept-back design taillight cluster that has black surround. It is equipped with elegant LED brake lights, turn blinkers and courtesy lamps. The rear bumper has dual tone look as it is fitted with a black colored lower cladding. This newly launched variant comes with a large wheelbase, which offers ample space inside the cabin. It is incorporated with a number of sophisticated features. The car maker has given it an attractive interior design, which is done up with ebony black color scheme, which is complimented by a lot of wood and chrome inserts. This newly launched Black edition variants are equipped with a few additional features. Its cabin is designed with black spoils, which gives it a classy and modern look owing to its bespoke seat cover. There is also an option to choose from the color combination of seat cover, which are Ebony and Lunar, Espresso and Tan along with Dark Cherry and Ivory. The driver oriented cabin with ergonomically designed seats and central fascia is a main attraction of the interiors. Its dashboard is quite sleek, which is equipped with a storage compartment with cooling effect, an instrument panel and an AC unit. It also has a leather wrapped steering wheel, which has an innovative design with four spokes and is done up with a dual tone color scheme. However, the front seats have 18-way electrical adjustment facility that adds to the comfort level. In addition to these, they have lumbar support and memory setting. All these seats have been covered with premium Oxford leather upholstery. This variant is fitted with a 4.4litre, SDV8 diesel power plant under the hood, which comes with a displacement capacity of 4367cc. It is incorporated with a direct fuel injection system that enables the vehicle to return a maximum mileage of 8.69 Kmpl and 13.15 Kmpl within the city and bigger roads respectively. It carries 8-cylinders, which are further integrated with 32 valves. This motor is capable of producing a maximum power of 335.2bhp at 3500rpm. At the same time, it can generate a peak power of 700Nm in the range of 1750 to 3000rpm, which is quite good. This engine is skillfully coupled with an efficient eight speed automatic transmission gearbox that transmits the torque outputs to all its wheels. It allows the SUV to attain a top speed in the range of 200 to 218 Kmph. At the same time, it can cross the speed barrier of 100 Kmph from a standstill in about 7.9 seconds, which is rather thrilling for the occupants sitting inside the cabin. The company has given this sports utility vehicle an advanced disc braking mechanism, which is quite reliable in every conditions. It is further assisted by anti lock braking system along with electronic brake force assistance and emergency brake assist, which boosts this mechanism. Apart from these, it also has electronic traction control along with stability program that adds to the advantage. It has cornering brake control that helps in minimizing the instability of vehicle, which can arise when brakes are applied, while turning at the curves. It also has a roll stability control system that decreases the chances of its rollover during extreme cornering or maneuvering. On the other hand, both axles are assembled with four corner air suspension system, which is highly proficient and keeps the vehicle well balanced. This helps in maintaining the stability of vehicle, while dealing with all jerks caused on uneven roads. The terrain response system is another vital aspect that reduces the efforts of driver besides improving the performance. In addition to these, this classy vehicle is blessed with hill descent control, which is also a crucial aspects for regulating the speed. The cabin is incorporated with a highly responsive steering system that reduces the efforts of driver even during heavy traffic conditions. This tilt and telescopic adjustable steering wheel support a minimum turning radius of 6.15 meters. For a luxurious driving experience, it is bestowed with a long list of comfort features. There is rear seat entertainment package offered to its passengers including 10.2-inch screens, which also has navigation system and a center console between rear seats with several control buttons. The four zone air conditioning system with fully automatic climate control function adds to its advantage. It regulates the air temperature inside and helps in creating a pleasant ambiance. The advanced audio system provides good in-car entertainment. It supports Bluetooth phone connectivity and has a television tuner as well. Besides these, the navigation system and rear executive class seating with cooler compartment are offered as optional features. Apart from these, it also has customer configurable interior mood light, auto-dimming interior mirror, power operated windows, twin blade sun visors, electrically adjustable mirrors, driver's seat with memory function, room lamps, front seat armrest and so on. In addition to these, the cabin of this variant is has also front seat with massaging function and driver seat with 18-way articulation. This SUV comes with a light weight aluminum body structure comes with impact protection beams and crumple zones, which helps in reducing the impact on occupants by absorbing maximum force caused at the time of collision. The dual front airbags along with side, seat-front, thorax and pelvis airbags reduces the damage caused in case of a collision. It has an engine immobilization device, which is available with volumetric as well as perimetric alarm system. Moreover, the active rear locking differential is offered as an optional feature. Apart from these, it also has front park distance sensors with visual display, traction control, seat belts, a high mounted stop lamp, electronic stability program, dynamic stability control and a few other such features. 1. Added features like front seats with massaging function and rear seat entertainment system. 2. Availability of terrain response system is a big plus point.